The Ape DCM Fundraising Party! Join us for an evening of live comedy, bites and booze, music, dancing, prizes and more, all to benefit an incredible journey! 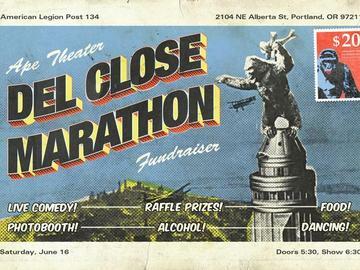 Three top Portland improv teams have been invited to New York City to perform in the prestigious 20th Annual Del Close Marathon improv festival, but we need your support to make that 3000-mile journey! Hailing from The Ape -- a non-profit theater and improv space in NE -- bigTiny, Rufio and Cashmere will be proudly representing Portland improv in The Big Apple from June 29th to July 1st, and this fundraiser will ensure all 13 performers can make the journey, rep the "weirdness," and experience the best of the biggest improv festival in the world. Dylan Jenkins and Friends: From The Ape’s very own Standing Upright**, host Dylan Jenkins joins top Portland stand-ups to give you the best the city has to offer and support the House Teams’ NYC dreams! The Ape House Teams’ Fam-Jam: The three traveling teams of top Portland improvisers join forces to give you a raucous hour of improvised shenanigans! Appetizers from Canton Grill will be available and are included in the ticket price. Alcoholic and non-alcoholic beverages, as well as other food items, will be available for purchase from the American Legion Post 134 Bar. BRONZE ADMISSION: General admission to the event. SILVER ADMISSION: General admission plus 3 raffle tickets. GOLD ADMISSION: General admission plus 3 raffle tickets plus VIP seating. If you can't make it but would like to help out, check out our GoFundMe page here. *House Teams perform every Thursday at 7pm and 8pm at The Ape, 126 NE Alberta St, $5 for each hour or $8 for the whole thing!